“Safety first” is the key message when enjoying North Carolina’s surf zone — not only for the Independence Day holiday, but throughout the summer and into the fall. Along the state’s oceanfront, officials suspect at least three deaths in June likely were caused by strong rip currents that pulled swimmers away from shore. One occurred on Bogue Banks, as a father tried to save his daughters. Two others were along the Cape Hatteras National Seashore in areas that do not have lifeguards. Two more swimming-related deaths on the seashore were not witnessed, thus officials do not know if rip currents were involved. Video by John McCord of the Coastal Studies Institute, in collaboration with the National Oceanic and Atmospheric Administration’s Ocean Today. 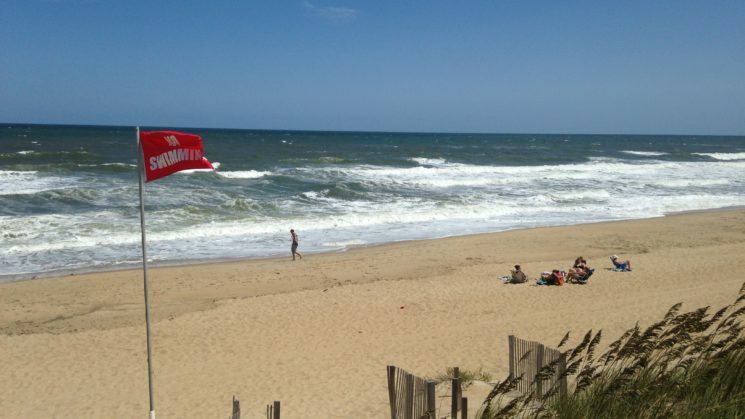 Stacey Sigler, safety manager for the National Park Service’s Outer Banks Group, encourages those who want to swim in the ocean to do so where lifeguards are present. On the seashore, there are three areas with guards during the summer season: Ocracoke Day Use Beach, Cape Hatteras Lighthouse Beach and Coquina Beach on Bodie Island. “There has never been a swimming-related fatality at a life-guarded beach at Cape Hatteras National Seashore,” Sigler notes. But Sigler knows that many folks want to enjoy the water in other locations. Since March 2017, the Park Service has installed more than 150 more rip current safety signs at parking areas and dune walkovers. Those are in addition to the dozens of signs printed by North Carolina Sea Grant that were already in place. Rip current signs from North Carolina Sea Grant can be seen along the coast. Sigler and others also reinforce rip current safety at a variety of education programs. Community partners also are part of the safety chorus, including Hatteras Island Rescue Squad, which has sessions for the public every Monday through Labor Day. The U.S. Lifesaving Association notes that its traditional estimate of a national average of 100 rip current-related deaths per year is likely low. That’s because USLA recently updated statistics from its member agencies regarding rip current rescues, which show nearly 82 percent of all rescues in the surf zone are related to rip currents. The USLA statistics reflect guarded beaches. But even those beaches are open to swimming at times when lifeguards are not on duty. And many other beaches, including miles of oceanfront in North Carolina, may only have roving emergency personnel, or no monitoring at all. North Carolina beach safety partners — including Park Service rangers, ocean rescue teams, National Weather Service forecasters, North Carolina Sea Grant specialists and members of the media — are reinforcing safety messages. Swim out of the current, then parallel to shore. Or float and tread water, then call or wave for assistance. “No matter what happens, the victim has the best chance of recovering if they can avoid overexertion — and panic often drives that,” explained Spencer Rogers, a specialist in coastal processes with North Carolina Sea Grant, for an Associated Press story that ran throughout North Carolina, as well as in papers across the country, from The New York Times to the Sacramento Bee. Flotation devices are important beach items, along with a phone that has the address of your exact location stored in a text or note in case you need to call 911 for whatever reason. Also, never swim alone. Families or friends should assign someone to stay on shore and watch swimmers of all ages. Before you head to the beach, check daily online rip current forecasts from NWS coastal offices at weather.gov. 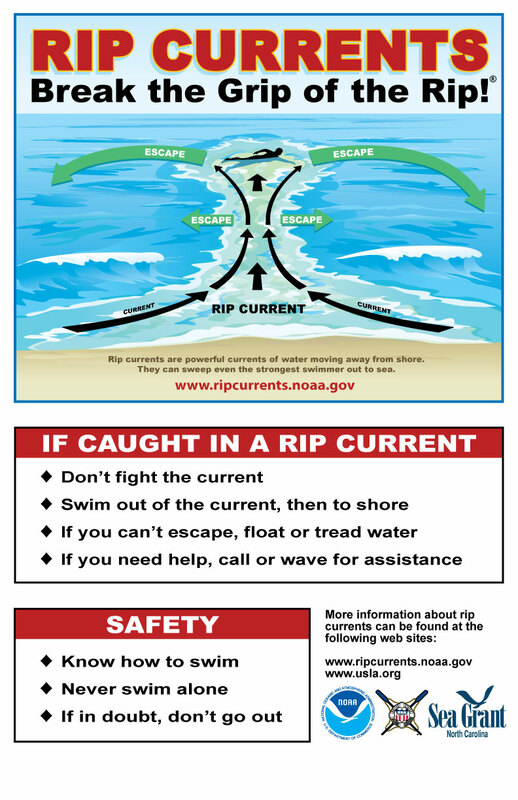 To purchase rip current signs or request brochures from North Carolina Sea Grant, contact Katie Mosher, kmosher@ncsu.edu.